The former president of the country's leading academic freedom organization said he was nearly forced to leave an open and free meeting at New York University of international faculty and graduate students discussing academic boycotts of Israel, due to his known opposition to such tactics. Cary Nelson, past head of the American Association of University Professors and professor emeritus at the University of Illinois at Urbana-Champaign, said the attempted ouster took place during the annual convention of the Modern Language Association at a Saturday strategy session on how to apply boycott, divestment, and sanctions—or BDS—against Israel within American universities. The event was promoted as "free and open to the public. Nonmembers and members of MLA are welcome. No registration required." Nelson, who leads the anti-BDS MLA Members for Scholars' Rights, said Judith Butler, an endowed comparative literature professor at the University of California-Berkeley and recently elected president of the MLA for 2020-21, led the session and proposed a vote to kick Nelson out of the meeting. Nelson said Butler asked him if he would honor their decision and remove himself from the room. When he made clear that he would not, she announced that given his presence, the group would not be able to proceed with their BDS planning as hoped. Much of the rest of the session was devoted to questioning of Nelson's motives for attending, he said, including interrogating him when he took notes. "Graduate students and contingent faculty were worried I would take down names and affiliations and derail their careers," he said. "How, I don't know. The Mossad [Israel's intelligence agency] does not take orders from me." Nelson recounted that one of the 30 to 50 attendees said his presence was helpful as "practice being in a hostile department in a hostile country." Butler, together with Stanford Professor David Palumbo-Liu, tried to convince Saturday's crowd that they were "victims" of the MLA's vote against adopting BDS in June 2017, said Nelson. "They told the people they had been sinned against, that they were victims of unethical conspiracy within MLA," he said. "They wanted to install in folks this sense of injustice." The program was advertised in a manner that looked like it was part of the official MLA convention offerings, said Nelson. The event was hosted by MLA Members for Justice in Palestine, whose logo in the Facebook invite bears a striking resemblance to that of the general organization, and "co-sponsored" by the official MLA contingents of Arabic Languages, Literatures, and Cultures, West Asia Languages, Literatures, and Cultures, and the Race and Ethnicity Forum. An MLA spokesperson said the event was not sponsored by the MLA itself. It was held off-site from convention activities. Nelson said if it wasn't officially affiliated with the MLA in any way, the event "shouldn't have been advertised that way." According to emails obtained by the Washington Free Beacon, MLA Executive Director Paula Krebs responded to concerns raised about Nelson's alleged treatment by San Diego State University Professor Peter Herman, by stating, "Dr. Butler did not call the meeting; she showed up to the meeting unannounced, just as Dr. Nelson did." The official Facebook event created ahead of the session listed Butler and Palumbo-Liu as speakers. Butler told the Free Beacon in an email, "Cary Nelson's rendition is fanciful and falsifying." "This was not an MLA session but an informal meeting. Several of us asked if he would like to leave and he declined," she wrote. "In fact, I defended his right to stay, as he well knows." Butler wrote that the meeting was "to address the question of how to keep the problem of Palestian [sic] Rights alive," and not the reintroduction of a BDS resolution. "I have no plan or power to do that," she wrote on the MLA revisiting BDS. Butler's 1990 work Gender Trouble, which argues gender is a social performance, is considered a seminal work in gender theory and continues to be taught in women's studies, lesbian and gay studies, and humanities undergraduate courses. In more recent years, she has published heavily on the Israeli-Palestinian conflict, indicting Israel as a settler-colonial state and promoting BDS as a non-violent civil rights movement. 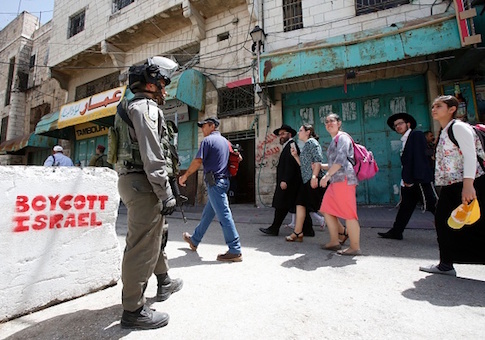 BDS seeks the dismantlement of Israel as a Jewish State, and prominent leaders, as well as activists, of the movement have been called out repeatedly for their anti-Semitic rhetoric, including glorifying and calling for violence against Jews.